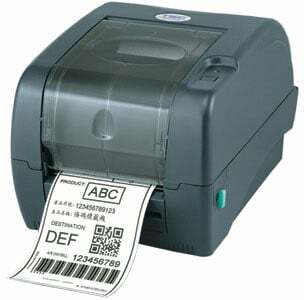 TSC ttp-345 - Thermal transfer printer, 300 dpi, 3 IPS, 8MB DRAM, 2MB flash, hardwired Ethernet, real-time clock, 8" outer diameter external unwinder. The new TTP-345 thermal transfer desktop barcode printer series delivers more performance for the price than any other printer in its class. The TTP-345 offers high resolution 300 dpi printing at 5 ips. Both models offer 8 MB of SDRAM and 4 MB of onboard Flash memory. Gigabytes of Flash memory can be added via an onboard SDHC card reader. By using two motors instead of the usual one, TTP-345 series printers operate at lower torque, reducing noise, decreasing wear and tear, and extending printer life. The platform"s user-friendly design makes it easy for operators to load and unload ribbons, and its 300-meter capacity is more than four times the industry-standard length for desktop printers. 2.36" x 984' Black Wax-Resin Ribbon, Compatible with Industrial printers and Polypropylene Labels, rolls/case: 6, Core Size: 1"
The TSC 99-127A003-F1LF is also known as 99-127A003-F1LF	or 99127A003F1LF	.